528 pp. 104 illus. Fully indexed. Copyright © 2005 by Lawrence A. Ruttman. All rights reserved. My hope is to keep going, and I hope the effect it will have is that it will interest people and tell them more about their own town. In a future sense, I want to preserve it. And as time goes on, and were gone, I want people to know what the town was. Im forming in my mind the making of a major project to go with the tercentennial of the town, 1705-2005. Three hundred years is a long time, and we have a story to tell. I want to tell the Brookline story not only to us, but also to all those out there. Ellen Goodman combines wisdom with witticism to alter our perceptions of the personal and political with an élan and style peculiarly her own. Her acumen was long ago recognized when she was awarded the Pulitzer Prize for Distinguished Commentary in 1980 before she had reached the age of forty, obliterating the long-held notion that wisdom is the province of those advanced in age and experience. One wonders how Ellen became the singular woman she is, and how much her upbringing in Brookline had to do with that, answers sought when I was fortunate to steal a few moments to interview her in October, 2004, amid the engrossing and enervating baseball and political days cascading towards the Red Sox victory and the Kerry defeat. Ellen provided some clues. During the bitter years of World War II, when Regina Barshak was hiding out from the French Police collaborating with the Nazis in hunting down Jews in the Paris of her native France, and Edward J. Barshak was beginning his emergence from his native Fitchburg to become one of Bostons most respected advocates, one could not reasonably have predicted that one day these two remarkable people would blend their still now separate and significant lives into a marriage of uncommon vitality, interest and fruition. Reginas mother, Ida, and father, Abraham, were Polish nationals. Regina and her brother, Max, both born in France, were French citizens. Max and others warned that a round-up of Jews by the French Police was imminent. On the very next day, while Max was out of the apartment, the French Police came, detaining Regina and her parents in a camp a few miles outside of Paris. As they were led away, Regina recalls that a neighbor yelled after them, cest bien fait pour les juifs. (It serves them Jews right.) After three weeks in the camp Reginas mother came to find out that the round-up was for Jews from other countries, not French Jews (whose turn would come), and went to the French Camp Commandant, pleading that Regina, born in France, and seventeen years old at that time, should be released. Surprisingly, the Commandant provided to Regina a release certificate. She left the camp, never again seeing her mother and father. The close friendship of twins Paul Epstein and Theo Epstein was forged not only on the playing fields of Brookline with which we are all familiar, but at other venues in Brookline which took on that character in the fecund sporting imagination of the twins, in league with their boyhood friends in the Parkman, Powell, and Brown Streets area of Brookline, where in earlier years Bob Kraft had contested, and where earlier still John F. Kennedy and Charles Kickham had competed at the Still Street playground. The twins athletic inventiveness extended from the streets into the Epstein Parkman Street apartment, where their jousts added to the maelstrom (appropriately, a word of Dutch extraction) of activity, Leslie cloistered, writing and listening to classical music, Anya in her room listening to pop music, the more decibels the better, Ilene rushing in from a long day at The Studio, transmogrifying from retailer to restaurateur to the Epstein family, while Theo and Paul were beating the heck out of each other in the apartment hallway, much to the chagrin of the neighbors. 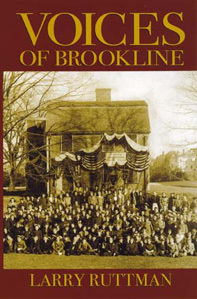 It may be that Robert T. Bobby Lynch, the present Director of the Brookline Recreation Department, whose own family history cuts deeply into the history of Brookline community, is uniquely qualified to judge the quality of that community, then and now. In our interview, Bobby spoke with affection and humor about family and friends in Brookline, calling them almost interchangeably by their given names and nicknames. Bobby comes by his interest in recreation naturally, following in the footsteps of his legendary father, James J. Tiger Lynch, for twenty-eight years the Director of the Brookline Recreation Department, and for whom the (former) James J. Lynch Recreation Center on Brookline Avenue was named. But why was James J. Lynch, Jr., called Tiger? Bobby explained: The Tiger was from his pro wrestling days. He wrestled for Brown University, and then went on to be a professional wrestler. And thats where it came from, Tiger Lynch. He wrestled at the old Boston Arena, in Canada, and all over the New England area. It was quite a story. This was when he first started out in the Brookline Recreation Department. Seasoned, skeptical, and sympathetic Town Counsel David Turner eloquently expressed his view that Town Meeting comes from the hand of God and is not an anachronism. Marshalls precociousness signaled the Paperback Revolution, forever changing the reading habits of America. From a lily white town of Yankees, Jews, and Irish that voted heavily Republican to the richly diverse and polyglot town of today that votes heavily Democratic, is an apt way to describe Brooklines transformation from the years of FDR to the tercentennial year of 2005. With such a profound change in the demographics and politics of the town, Brooklines essential character could have changed too, but that has not been the case. Now, as then, Brookline demonstrates a commitment to fine public schools and public services. Its citizenry still dynamically participates in the governance of the town, most notably in its representative Town Meeting, but also on the many boards and committees that comprise Brookline government.